Just recently I had lunch with former Mayor Ed Koch, and I have to say it was a very pleasurable experience. Some politicians just have “It.” Charisma, personality, charm, the ability to connect with people. Koch has always been one of them. For 25 years, Koch and I have always had a traditional Newsmaker/Journalistic relationship. I’ve known him as the city’s personable and witty three term mayor, but this time over lunch was different. He was again literally standing as tall as he did when he was mayor. He’s a man in his 80’s, who has had heart problems, but on this day Koch was in his prime. Every weekend, he dines for the most part, with former members of his administration, and it was remarkable to watch Koch hold court without missing a beat. In all these years, I had never seen the private Ed Koch. But this time I did. The logic has escaped me for for several days now, and I still just don’t get it. What good can possibly come out of keeping open 19 failing NYC schools? The State Appeals court recently ruled against the City of N.Y that wanted to close the schools for low performing results, in favor of the United Federation of Teachers and the NAACP. When it comes to the budget, Paterson is taking one for the team. 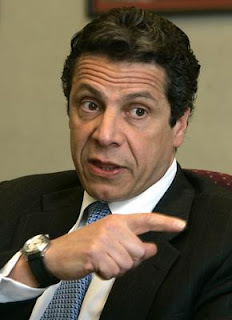 He's biting the bullet on Andrew Cuomo’s behalf. Mr. Cuomo, the gov-in-waiting should thank Paterson immensely. Perhaps it explains why publicly Cuomo in general has been offering praise Paterson’s way. Most governors in Paterson’s shoes with only a few months to go, would only be concerned about their legacy. In other words, Paterson could punt on the state’s horrible budget situation, simply passing on the enormous problem to the next guy. “ALBANY — Negotiations over Gov. ………… plan to cut $1 billion out of the current state budget stalled today, legislative leaders said, making it extremely unlikely that a package will be in place for lawmakers to vote on when they return to the Capitol on Monday. If he sees an “opening”, Mayor Michael Bloomberg may decide to run for President. Bloomberg flirted with running as an independent in the 2008 race, and to me, it has become increasingly clear that Bloomberg is itching for a new challenge. Of course under normal circumstances an independent candidacy wouldn’t have much of a chance at all, but these are not normal times, and you already know the rest of the sentence, Bloomberg is not a normal politician. An incoming governor vows change is coming to Albany. The legislature responds we will see about that. At the Democratic Convention last week, Andrew Cuomo took questions on how he will handle next year’s budget. “I’m not going to raise taxes; I’m not going to have a wage increase for public employees,” he said. If State Republicans were not already facing enough of an uphill battle, what in the world are they going to do to combat the Andrew Cuomo-Rochester Mayor Robert Duffy ticket? You have to tip your hat to Cuomo, this selection is good. New York City voters may not initially be impressed, but upstate is. Upstate often feels neglected when it comes to downstate, and downstate dominated political tickets. But now, they not only have the popular Cuomo (based on polls) but one of their own. The race for governor is starting to heat up—but not necessarily between the candidates. Instead it’s the top democrats. Soon to be Democratic nominee for Governor Andrew Cuomo and the powerful speaker of the Assembly Sheldon Silver. Of course both men are downplaying a disagreement. Cuomo has started doing media interviews and Monday told Fred Dicker, the state editor of the NY Post ( on Talk Radio 1300 AM in Albany) he did not see Assembly speaker Sheldon Silver as an "obstacle" to his agenda. Political consultant Basil Smikle is off and running against Harlem State Senator Bill Perkins. You might as well call this the race over choice. That is charter school choice. Perkins does not support charters, but the problem that could cost Perkins his job is his position does not sit well with many parents in the district. Huge week for “Governor in waiting” is coming up. In the suburban battleground area of nearby Westchester County- The race for governor is about to officially begin. As State Democrats meet, they can forget Governor Paterson’s poll numbers, and start the coronation towards the future. It’s Andrew Cuomo moment in the sun. It was be interesting to see how Cuomo is nominated and how he accepts his party’s backing? What role does his father (Democratic icon and three term N.Y. Governor Mario Cuomo) play at the convention, if any?